Canned with fresh sardine in the pure tradition, the particular feature of these recipes is that they are flavored with very different ingredients to satisfy the palates of the finest connoisseurs. 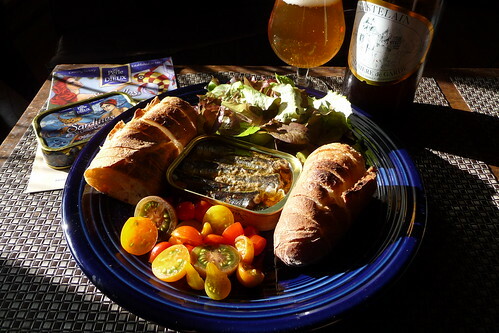 Smoked ham and goat's cheese sardines are to be eaten alone with pre-dinner drinks, or accompanied by cherry tomatoes, etc. This is quoted from a brochure describing the different tinned fish available from La Perle des Dieux. Said brochure came with the tins. More Baby Greens from our garden. I had high expectations here and they were met. The tin smelled delicious as soon as I popped it. Five meaty fish. Filleted but not skinned. This fish looked a bit better than Philippe's (SSK). A subtle yet available herb taste and a certain creamy flavor, maybe. No bits o cheese but a whole small black olive. Here again, the fish with greens and baguette is amazing. After the fish was gone I soaked up the oil and finished off the greens and tomatoes. It must be like reading about heli-boarding in Canada or the Galapagos. Five out of Five Tins. Processed fresh, just at the right moment of the season, our sardines are manually canned after being freshly killed, tails and heads having been removed. They are covered in the finest extra virgin olive or vegetable oil. Thus prepared in the traditional manner, our sardines then mature with time (turning the can every 6 months). This came from the same said brochure. 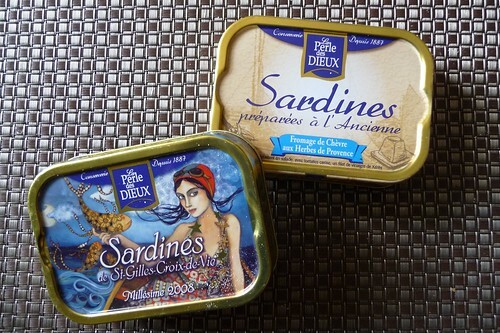 The Saint Gilles Croix de Vie Vintage Sardines "2008 Vintage"
A beautiful tin. It will rest easy. Too be turned and admired and turned. I'll share this with the Society Members of the Next Generation. The Lads. Glad you appreciated the amazing encounter of goat and sardines. Worth the try isn'it ? I'm sure the sardinistas have still much to discover from ol'european primary tribes !